This book proposes a significant reassessment of the history of Iraq, documenting democratic experiences from ancient Mesopotamia through to the US occupation. Such an analysis takes to task claims that the 'West' has a uniquely democratic history and a responsibility to spread democracy across the world. It also reveals that Iraq has a democratic history all of its own, from ancient Middle Eastern assemblies and classical Islamic theology and philosophy, through to the myriad political parties, newspapers and protest movements of more recent times. 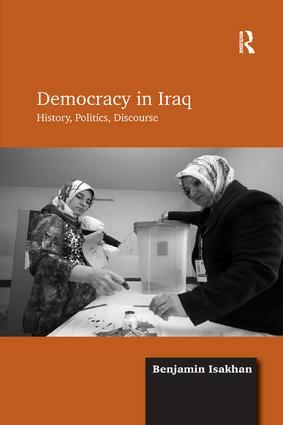 This book argues that the democratic history of Iraq could serve as a powerful political and discursive tool where the Iraqi people may come to feel a sense of ownership over democracy and take pride in endorsing it. This could go a long way towards mitigating the current conflicts across the nation and in stabilizing and legitimating its troubled democracy. Taking an interdisciplinary approach and referring to some of the most influential critical theorists to question ideological assumptions about democracy and its history, this book is useful to those interested in political and legal history, human rights and democracy.